Add a touch of personal expression to your work with uni-ball 207 BLX Infusion gel pens. The unique BLX Infusion series features black ink with a hint of color. Features exclusive uni Super Ink which helps protect against water, fading, and fraud. The specially formulated pigment based gel pen ink contains particles that form an indelible bond in paper - it can't be broken…ever. 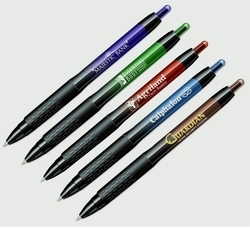 The textured rubber grip offers superior writing and control, while the retractable gel pen tip provides added convenience. Do not be a victim! Check washing is a form of check fraud where criminals steal checks from the mail and erase the handwritten ink using common household chemicals. They then rewrite the checks to themselves for any amount they choose. The pigmented ink in the Uni-ball 207 Gel permanently binds itself to the paper fibers in the check, and cannot be washed off or removed! The new and improved uni Super ink formulation offers a clean write every time. 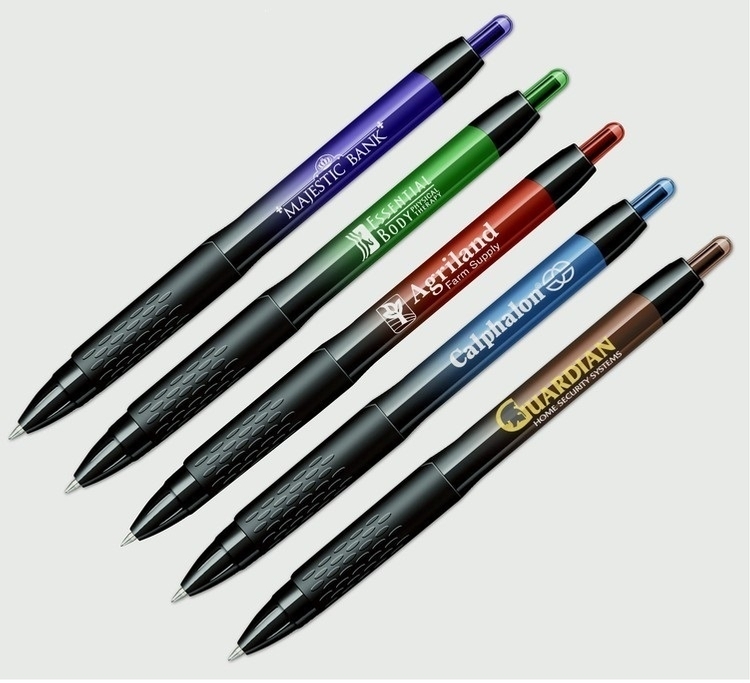 With improved fade and water resistant 0.7mm blue/black, brown/black, purple/black, red/black, and green/black, you can't afford to write without this pen. The stylish design and comfortable grip of the 207 Gel will top off a promotional plan for any business. •Experience color like never before. Differentiate yourself with the deep, rich write of BLX black infused colors. Imprint Area: Barrel - 0.5"H x 1.375"W (180 degrees from clip). *Orders without camera-ready art or requiring special design services are subject to an additional art change. *If multiple colors are ordered, each color must be 25% of minimum order quantity.